This is a story of what happened when we sprayed ‘Ego Pullers’ on Millie Teodori garden in June 2000. Millies beans had been eaten down to the stalks by rabbits to the point there was sure to be no crop. She also had a problem with her tomatoes not flowering well enough, due mainly to overfertilisation with ‘miracle grow’. Not having my agricultural BDMax BD sprays with me I used a Human ‘relative’ spray – Ego Pullers, to address both problems. I sprayed the larger patch of beans and one patch of tomatoes while leaving one row of beans near the tomatoes unsprayed. 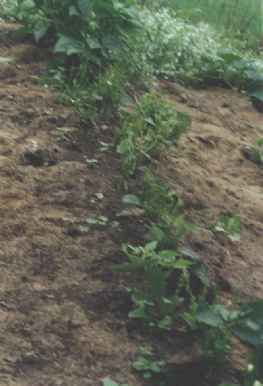 This is a picture of the unsprayed row of beans after three weeks. Initially this row was also untouched. ( they were close to sprayed tomatoes) After about 10 days the rabbits started to feed on them again. This picture is also an example of how the rows below looked prior to spraying. 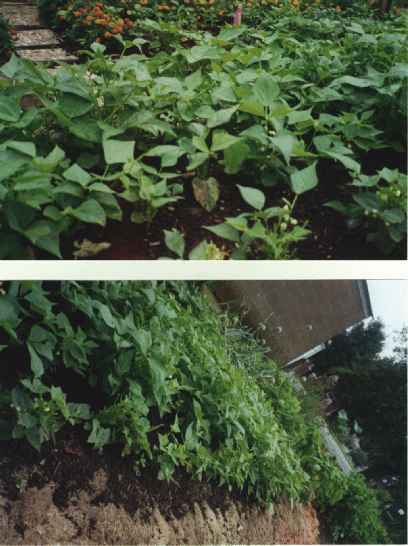 These are two photos of the beans three weeks after spraying. The row in the front of these pictures were the oldest rows of beans and therefore the worst hit and the slowest to regenerate. Rabbits like other pests are a manifestation of an environmental energetic inbalance. These can be caused by many things however mostly some soil inbalance. The BD preps work to balance the soil & energetic environment. Thus once the balance is created then the pest can not stand to be in the environment and stays away. Part of the energetic sphere of life are the four ‘body’ realms Physical, Etheric, Astral and Spirit. Flowering and fruiting of plants is due to a strongly working Astral and Spirit spheres. These were overpowered by the over fertilisation of both the beans and tomatoes. The ‘Ego (spirit) Pullers’ pulled these spheres closer to the tomatoes and hence they flowered and fruited. Interestingly rabbits and mammals in general fill a similiar energetic niche. Hence if these bodies are not working together well then rabbits or some similar pest will appear. Ego Pullers are usually used for sharpening a Humans thinking and general focus. We first experiemented with keeping rabbits off gardens in 1989 on Waiheke Is in New Zealand. The woman invovlved would spray the paths around beds she wished to protect with great success. This has been repeated on commercial sweet corn crops and nursery crops since then.